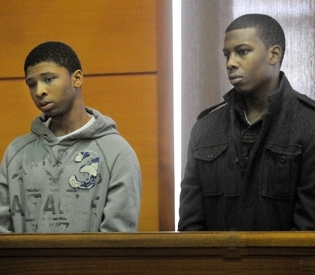 They are accused of selling crack cocaine from the house they shared with relatives in Framingham, Massachusetts. As is sadly predictable, people who get involved in the recreational pharmaceutical industry eventually get arrested by the local police. What happened next was also sadly predictable. The people involved seem to be asking the wrong questions. They keep asking why highly trained people would make the mistake of shooting during the entry. The real question we need to ask is why are we allowing police officers to serve search and arrest warrants after midnight with grenades and machineguns? You can’t possibly tell me that these two guys NEVER left the house. How hard is it to arrest them during a traffic stop, or on their way to the car? Sure, the (alleged) criminal actions of these two, including several outstanding warrants on the guy on the right, brought down the law on this family. We expect criminals to do bad things. What we also expect is for our paid professional police officers and their leadership to make intelligent decisions. It’s time we demand that our police officers stop serving search warrants like this. There is a time and place for door kicking, tap, tap, bang, bang, slayin’ fricken’ bodies, but that place is hostage rescue, not drug search warrants. A huge tip of the hat to Radley Balko, whose tireless efforts in this regard will make the difference in changing this broken system. Interesting wording. Stamps wasn’t killed by a cop. Rather, Stamps was “fatally struck by a bullet which was discharged from a SWAT officer’s rifle.” I’m also fairly certain that if Mr. Stamps had been the one whose gun discharged a bullet that fatally wounded a SWAT officer, Mr. Stamps’ name would have been released to the public rather quickly. And Carl’s initial statement to the press would have been less ambiguous. Go read this story there. Remember, this can happen to you. A wrong number on the search warrant, a cop who picks the wrong house in the night, or a neighbor with a grudge that falsely accuses you. Even if everyone in the house was guilty, what did we gain by the shooting?